Watt's Up? : To autoscale, or not to autoscale: that is the question! To autoscale, or not to autoscale: that is the question! 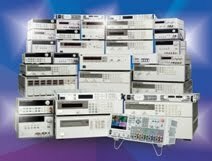 Should a test equipment user use the autoscale button or not? If so, why? If not, why not? How is autoscale related to power, you ask? One of our Agilent power products, the N6705B DC Power Analyzer, has a build-in scope-like function with an autoscale button. The built-in scope is useful for measuring things like dynamic current flowing into a device or for looking at the response to an arbitrary waveform that can also be generated with the same product. To autoscale in Scope View mode, you push an N6705B front panel Autoscale button to automatically scale the vertical and horizontal axes to show you the waveforms on the scope screen. While this may seem like a convenient feature, there are times when using autoscale on any instrument (like an oscilloscope) does not result in the display that you want. And some signals cannot be captured with an autoscale feature. The signal must be repetitive and typically meet certain minimum vales of voltage, frequency, and duty cycle. But more importantly, using autoscale eliminates having to think about the signals you are trying to observe. While this may seem like an advantage, I think it makes us lazy and less likely to understand what we are doing. These days, we have grown too accustomed to just pushing a button to accomplish a task. We push a button to heat our food using a microwave. We push a button to cool our homes using our central air conditioning thermostat. We push a button to turn on our computers, get food, candy, and drinks from vending machines, get cash from an ATM, start our (modern) cars. We push buttons all day long! But when it comes to test and measurement equipment, we are trying to gain insight into the circuit or device we are analyzing. And I believe that insight starts with thinking about the waveforms we are trying to display. Thinking about what the waveshape is supposed to look like…how to trigger on the signal….what the approximate maximum voltage (or current or power) is….whether or not this is a repetitive waveform or a single event. Thinking about these things brings us closer to the insight we want to glean from the signals we examine. And ultimately, it is that insight that we seek. So just pushing a button to get a signal on a scope screen provides us with little insight; in fact, it could bias our thinking into mistakenly believing that what we are seeing is correct because we did not bother to think about what the waveforms are supposed to look like ahead of time! So I say “no”, a test equipment user should not use the autoscale button for the reasons stated above. In fact, for years, I have trained new engineers and some of our sales people, and I have been known to say on more than one occasion, “No self-respecting engineer would ever hit the autoscale button!” Of course, I am only half-serious about this statement, but I think it supports my view that it is useful to think about what you expect on the scope before just viewing the waveforms. Of course, you should ALWAYS think about whether or not what you see on the display is expected and makes sense. After all, why else would you look at the signals?